Get notified when Houston Dynamo tickets are available! Houston Dynamo is an American professional soccer team out of Houston, Texas. The team competes in Major League Soccer as part of the Western Conference. 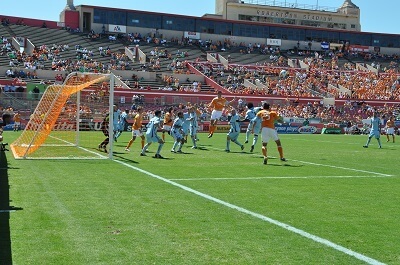 The Houston Dynamo played their first home game at the Robertson Stadium on the campus of University of Houston until they moved to their home stadium, BBVA Compass Stadium, in 2012. They won the 2006 and 2007 Major League Soccer Cups in their initial two seasons, and in 2008 was recognized as the first MLS team to take a point in Mexico. See them play at their next game near you by purchasing Houston Dynamo tickets using the links above.